Rod Taylor, originally from Lubbock, Texas, has been playing music for more than 30 years both solo artist and with regional bands including The Rounders and currently The Rifters . He has performed at many cowboy music and poetry gatherings around the country including: The Texas Cowboy Poetry Gathering in Alpine, the Arizona Cowboy Poets Gathering, Santa Clarita Cowboy Festival, and the National Cowboy Hall of Fame in Oklahoma City. His unique combination of being well versed in cowboy lore, traditional western music, as well as a working cowboy, allows him to bring an authenticity to the musical craft. Rod began his cowboy career while in High School / College at both the C Bar and Philmont Ranches. Rod left Texas Tech to pursue the cowboy life and worked at the Vermejo Park / WS, TO, UU Bar, and Little Horn Ranches. He also cowboyed on the Philmont Ranch which is owned and operated by the Boy Scout of America. Philmont has 300 horses, 250 cows, 100 donkeys and 100 buffalo on 137,000 acres. Rod was responsible for the cowherd and lends a hand with the additional livestock. 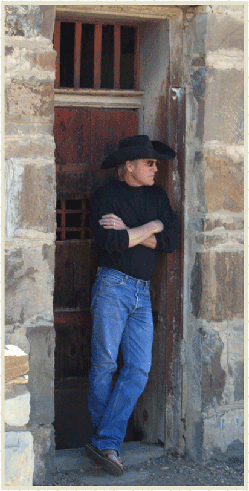 Starting in 1990, with release of the album "Riding Down the Canyon" , Rod has continued to work on music projects that include the 1995 album "A Philmont Collection" , the self titled Rifters initial release of mostly original tunes, and his latest album entitled"Here, There or Anywhere" . His artistic work also includes acting and has been in film projects that include The Missing (directed by Ron Howard), the Stephen Frears 'film Hi - Lo Country , the Angel Maker Episode of Lazarus Man , and other projects from Tish Honojosa' s CMT music video , to television commercials, to PBS Documentaries. He is a Sage Award and Rounder Award recipient in addition to a past AWA Nominee. Rod retired from the Philmont Ranch in New Mexico, currently cowboys on the side, and lives with his wife Patty and has been active in coaching baseball and the Cimarron Maverick Club (that sponsors the Nation's oldest open 4th of July Rodeo). Rod and Patty have two sons who have also added an artistic edge to their lives with an accomplished sculptor and painter, and the other accomplished musician and prolific songwriter.